In KPI dashboards, speed rules supreme; Project Managers need tools that let them make effective decisions without scrutinising every digit of their data for answers. The ways which dashboard providers provide fast decision making are becoming increasingly elaborate, but there is a very simple way you can speed things up; through Red-Amber-Green (RAG) charts. It’s no secret that project management requires great time management and organisational skills. One type of data visualisation which greatly helps with both of these skills is the heat map. Imagine you have lots of data and metrics which you need to keep track of, such as statuses, targets, and completion rates. Because there’s so much data to manage at once, project managers are often forced to use spreadsheets in Excel to keep all their data in one place. However, you can put tabular data in your project management dashboard with heat maps. Heat maps use colors to make table-based information understandable and actionable at a glance. Take a look at the above heat map. You’ll notice that each cell is colored in various shades of red and green. Each cell has a target assigned to it, with the color and shade representing target status. 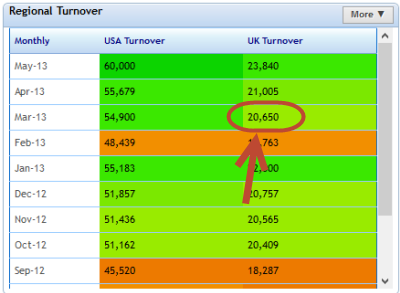 For example, take the UK Turnover KPI for March 2013. This cell is colored a paler green than the value for May 2013 because while the target has been met, it hasn’t been exceeded by very much. Every other cell in this heat map functions in the same way. This way, if you need to know the current status of each of your KPIs, you simply glance at the heat map, and you’ll know immediately. Because of the variation in colours, you can also use a heat map to compare KPI status. The key to getting this right is to clearly define what each color shade means, and implement it consistently across the heat map. Once you have this system in place, it is easy to compare two similar KPIs and get information from colour alone. This particular heat map was created using Target Dashboard using the new colour-coded table summaries feature. For more information, take a look at this blog post! When managing multiple status indicators and KPIs, you often need to see visualisations of your data across time. When you multiple categories of the same KPI (such as budget deviations), you can easily compare KPIs with the same targets using threshold lines colored red, yellow and green. 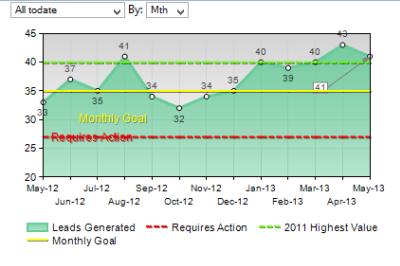 Threshold lines can be used as a way of putting multiple KPI targets on the same chart. Using the example of budget deviations, you may have different levels of acceptable deviations which you use to keep track of the different stages. With these particular threshold lines, you can set them to be any value on the fly, without changing the data in your data table. A quick note about threshold lines - these differ a little from just visualising your project management KPI targets in a line chart. In a dashboard visualisation program such as target dashboard, threshold lines can be spontaneously added to a chart, without having to enter a target value into your table of values. This way, you can assign different levels of targets to many KPIs quickly and easily, letting managers quickly find trends in their project data. Often, a column chart is the simplest and most effective way to display your data over time. But managers need to be able to see trends in data quickly in order to take effective action. In a previous article, I’ve described how you can use target lines charts to split columns and see where targets have been met and failed. However, when you have to manage multiple KPIs at once, constantly comparing columns to target lines can be tricky. 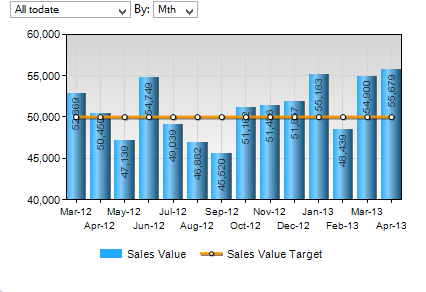 You can save a lot of time by using column charts which change colour depending on target status. In this example, the columns each show the number of issues resolved for a project every month. Since we have a target value for each month, every month where this value falls below target is red, and every month over target is green. This gives us a simple chart where you can see trends in targets at a glance, and then use the columns to find directional and value based information. A quick note about these coloured column charts – since most of us have been trained throughout our lives to recognise red and green as good and bad, this makes is slightly tricky to display multiple coloured column charts alongside each other in the same chart space. Therefore, what I recommend is to place each of your KPIs in its own space on your dashboard. Having too many columns can clutter up your charts and make them difficult to discern at a glance, so having multiple charts for your coloured columns is a better idea than cramming them all into one. As a project manager, you are responsible for seeing your project through to completion. This requires you to manage multiple KPIs and metrics, and analyse your data to make important decisions. Therefore, you need data visualisations which give you the information you need instantly. Using red, amber and green to indicate the status of your targets means that you don’t need to scrutinise your KPIs at all to find actionable information. By using the three methods outlined in this article, you can save valuable time and effort while still making confident decisions. If you’d like to try out these ideas for yourself, check out the free demo of our dashboard software, Target Dashboard now! Or read our in-depth Best Practice for tips on creating a project management dashboard. However, these aren’t the only ways you can use colour for better decision making. Have you found another way? Why not leave a comment below and let us know!